Hawaiians and supporters gathered yesterday morning outside federal court as the first of three landmark challenges to Hawaiian entitlements got under way. A federal judge indicated yesterday that she will probably remove the Department of Hawaiian Home Lands and the federal government as defendants in a lawsuit challenging the constitutionality of entitlement programs for native Hawaiians. Such a ruling would leave the state Office of Hawaiian Affairs as the only defendant in the Arakaki vs. Lingle lawsuit. While U.S. District Judge Susan Mollway did not dismiss the two defendants yesterday, she issued a written note to attorneys that indicated she was inclined to do so when she issues a final ruling in about two weeks. Her indication was seen as a victory for native Hawaiians, who already were celebrating federal Judge Alan Kay's ruling earlier in the day that struck down a challenge to Kamehameha Schools' Hawaiian-preference admission policy. "We would celebrate the victory for Hawaiian Home Lands, but it is a victory we will take one step at a time," said Haunani Apoliona, board chairwoman for OHA. "It's important to underscore to all native Hawaiian beneficiaries this still does not take the native Hawaiian community out of harm's way," Apoliona said. 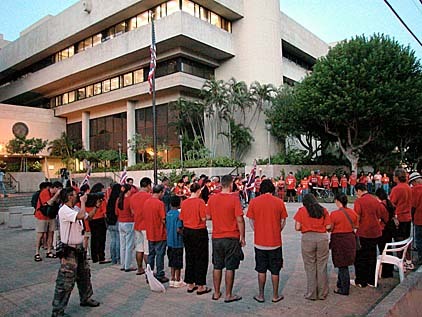 Earl Arakaki and 15 other Hawaii residents sued the state, DHHL and the Office of Hawaiian Affairs in March 2002, challenging the agencies' constitutionality, contending race-based programs discriminate against non-Hawaiians. The federal government was later added as a defendant. In court yesterday, Mollway questioned the plaintiffs' standing to file suit against the federal government and DHHL, which was set up under the federal 1959 Statehood Admissions Act. The hearing addressed motions stemming from a September ruling by the 9th U.S. Circuit Court of Appeals that upheld two lower court dismissals of separate lawsuits that also challenged programs offered by the Office of Hawaiian Affairs and Department of Hawaiian Home Lands. The appeals court upheld rulings that said plaintiffs John Carroll and Patrick Barrett lacked the standing to challenge the programs. The 9th Circuit ruled that to challenge the Hawaiian Homes Commission Act, the plaintiffs had to address the Admissions Act and argue its constitutionality. Under Mollway's reasoning, if the plaintiffs do not have standing to challenge the Admissions Act, they do not have standing to challenge the Hawaiian Home Lands program, said state Attorney General Mark Bennett, who represents DHHL in the suit. "We remain very optimistic that as this case goes on, we will be able to obtain judgment with regard to the claims against OHA as well, but we're taking this case one step at a time," he said. Mollway, who ruled earlier that the plaintiffs have limited standing as state taxpayers to proceed, indicated that they cannot challenge state spending by DHHL or OHA that does not come from state tax revenues. H. William Burgess, one of two attorneys who filed the suit on behalf of the plaintiffs, said if Mollway rules as she has indicated, their case will be reduced to a shadow of the original suit. "It's not the case we filed and want to proceed with, but we will follow through and we're in it for the long run," he said. He had argued that state taxpayer standing is sufficient to challenge federal law, but could not cite any case law. With OHA remaining as a defendant, the plaintiffs will only be allowed to challenge the constitutionality of using state tax revenue for OHA, he said. Burgess agreed to the dismissal of three plaintiffs from the case: Sandra P. Burgess, Donna M. Scaff and Evelyn Arakaki. He said they do not have standing to sue because they have some degree of Hawaiian ancestry and are potential beneficiaries of OHA.